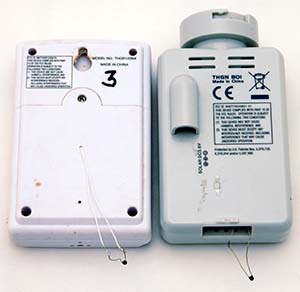 Wireless sensors made by Oregon Scientific have a specified temperature accuracy of plus or minus 1C (over a range of 0C to 40C) and plus or minus 2C outside that range. The actual accuracy provided by any one such sensor might be much better than this, or it could be right at the limit of published accuracy. Without more accurate thermometers, there is no way for the average person to know whether a sensor is "really good" or just barely meets published specifications. While this is an acceptable amount of error for many purposes, some may desire a more accurate temperature sensor. This project can improve the temperature accuracy of these sensors to the neighborhood of plus or minus 0.2C to 0.3C over a range from 0C to 50C. Along with replacement of the factory thermistor, there is the option to extend the thermistor outside the wireless sensor housing for faster response times. The only down-side to this project is that sensor humidity readings will be less accurate after modification. As a result, some may wish to purchase temperature-only wireless sensors for modification. Click here to download a ZIP file containing instructions and software tools for this project.